Answer: One never knows when an audition will arrive, or how it will arrive, or from what source: agent, Internet, fellow actor, former colleague, an actor’s mailing list and who knows where else. Making sure you’re always well stocked with an actor’s kit makes you instantly available for an audition. Here’s the first of a two-article series (the second article is here) that gives you a list of what’s inside that kit. In my car, you will always find two things: a cold bottle of water and my actor’s kit. Some actors carry bags, some carry backpacks, some carry portfolios. After a couple of different CDs suggested that being able to quickly get at your headshot/resume without unzipping or unbottoning or unclasping or unwinding or decloaking is a good idea, I found just the item I needed at Staples. 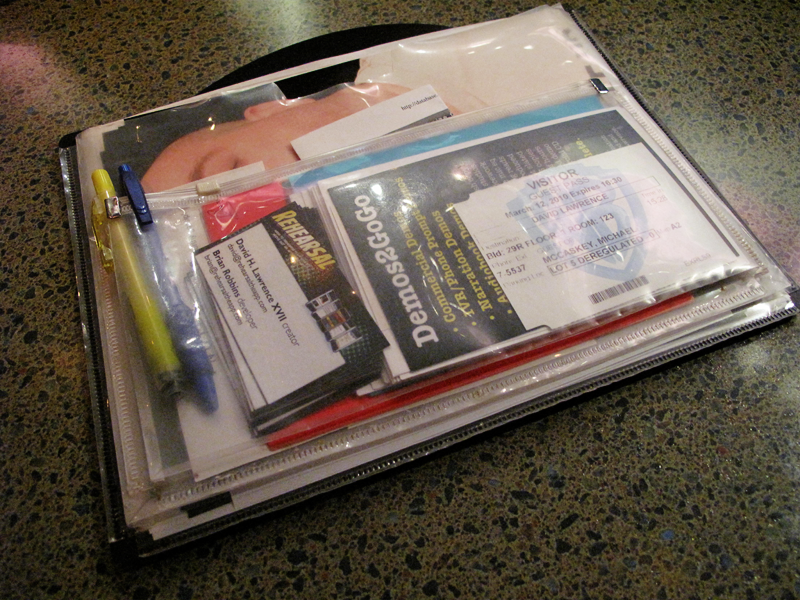 Headshots/resumes. My headshot photographer, Terence Heuston, is amazing. Our session yielded 8 or 9 looks, of which I use three to submit when I hand my headshot to a CD. One is harsher for villain stuff, one is sort of an everyman look, and one is for comedy. I have a few others of which I carry one each, but I carry 5 copies each of my main headshots. I print my resume directly on the back of my headshots with my trusty Epson Artisan 50 printer, and I immediately replace the shots in my actor’s kit with new versions should my resume significantly change. Highlighters. You get a script, you highlight your lines. I prefer yellow, but you might want to carry several if you’re an actor that goes highlighter crazy and highlights different characters in different colors. I carry the clickable Pentel Handy Lines highlighter because it doesn’t have a cap I can manage to lose, and it’s slimmer than most highlighters. It’s also refillable, but it’s so inexpensive, it’s hardly worth the effort. Business cards. Like any other business, you need to be able to take advantage of interactions with others that can provide you work, leads on work and general networking. That means carrying the worldwide accepted format of promoting yourself: the business card. I take it one step further to create a memorable moment of levity: I create and purchase a new business card whenever I get a new part, and when I offer someone a business card, I grab a handful from my actor’s kit and fan them out in a pick-a-card fashion. People love choosing their own, and it speaks very loudly (without being boastful) to the depth of my experience. Promotional postcards. Whether it’s a production I’m in, the voiceover demo service I offer or my iPhone app, Rehearsal, I carry an assortment of postcards that I can offer to people who express interest in those items when they meet me, or to spend time while waiting in offices and studios addressing and posting to promote them. Most of the time they are 4×6, but I can accomodate oversize postcards should I have something really powerful to promote. I also carry postage stamps (as you’ll soon read) should I want to put some stuff in the mail. There’s more that should be considered for your actors’ kit – including special consideration for women and what they need to lug around. You’ll find that in the second part of this series of articles. Not anywhere close to being a professional actress in an universe, alternative or realistic, but I found this entry particularly interesting and fascinating! thanks! One alternate idea: I do not carry my CastingFrontier.com bar code with me. Instead, I loaded the barcode page from CastingFrontier.com on my iPhone, then took a screenshot of that page. Either reloading that page in Safari or pulling up the photo from my library, will do the trick at a commercial audition. Their scanners read from my iPhone quite reliably. Great article. I tired looking for the folio at Staples and couldn’t find it. Who makes it? I actually don’t see a logo on this item, but I’ll investigate and update here. This was an interesting read. I keep a thumb drive with electronic versions of my headshot, resume and other various actor-related documents.